The size of many of these RBC's is quite small, with lack of the central zone of pallor. These RBC's are spherocytes. In hereditary spherocytosis, there is a lack of spectrin, a key RBC cytoskeletal membrane protein. This produces membrane instability that forces the cell to the smallest volume--a sphere. In the laboratory, this is shown by increased osmotic fragility. 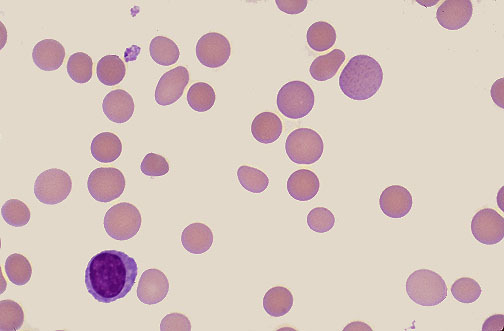 The spherocytes do not survive as long as normal RBC's. Question: What is the frequency and inheritance pattern for hereditary spherocytosis? Answer About 1 in 2000 persons of northern European ancestry are affected, 75% in an autosomal dominant fashion.